The late 19th and early 20th centuries in Ireland were dominated by the Irish pursuit of Home Rule or independence from the United Kingdom. Home Rule — limited self government — was passed by the British parliament in 1914, but postponed because of the outbreak of the First World War. Some Irish republicans saw Home Rule as being too limited a form of independence. After the Easter Rising in Dublin in 1916 when armed Irish nationalists staged a rebellion against British rule of Ireland, Irish nationalism was greatly radicalised and after public outrage at the execution of the rising’s leaders and the threatened imposition of conscription on Ireland for the First World War, it was channelled into the revolutionary Sinn Féin movement. Sinn Féin won 73 out of 105 seats in Ireland at the 1918 general election, and in January 1919 the First Dáil declared an independent Irish Republic. 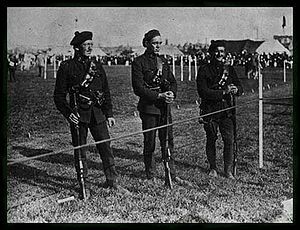 In the same month, the Irish Volunteers, or Irish Republican Army, began the guerrilla campaign known as Irish War of Independence, which in 1919 consisted of attacks on the Royal Irish Constabulary. In January 1920, the British government started advertising in British cities for men willing to “face a rough and dangerous task”, helping to boost the ranks of the Royal Irish Constabulary (RIC) in policing an increasingly anti-British Ireland. There was no shortage of recruits, many of them First World War army veterans, and by November 1921 about 9,500 men had joined. This sudden influx of men led to a shortage of RIC uniforms, and the new recruits were issued with khaki army uniforms (usually only trousers) and dark green RIC or blue British police surplus tunics, caps and belts. This mixture gave rise to their nickname, the Black and Tans (in Irish, na Dúchrónaigh), from the name of a famous pack of foxhounds from Limerick, the Scarteen Black and Tans, whose colours were and are similar. The name stuck even after the men received full RIC uniforms. The new recruits received three months’ hurried training, and were rapidly posted to RIC barracks, mostly in Dublin, Munster and eastern Connacht. The first men arrived on 25 March 1920. The government also raised another unit, the Auxiliary Division of the constabulary, known as the Auxiliaries or Auxies. This group was made up of ex-army officers. The Black and Tans acted with the Auxiliaries in the government’s attempts to break the IRA. Members of the Black and Tans were paid the relatively good wage of 10 shillings a day plus full board and lodging. With minimal police training, their main role was to strengthen the military might of police posts, where they functioned as sentries, guards, escorts for government agents, reinforcement to the regular police, and crowd control, and mounted a determined counter-insurgency campaign. The Black and Tans and the Auxies became known as Tudor’s Toughs after the police commander, Major-General Sir Henry Hugh Tudor. They were viewed by Republicans as an army of occupation because of these duties. They soon gained a reputation for brutality, as the RIC campaign against the IRA and Sinn Féin members was stepped up and police reprisals for IRA attacks were condoned by the government. Constable Alexander Will, from Forfar in Scotland, was the first Black and Tan to die in the conflict, during an IRA attack on the RIC barracks in Rathmore, County Kerry, on 11 July 1920. The Black and Tans were not subject to strict discipline in their early months in Ireland and as a result, the deaths of Black and Tans at the hands of the IRA in 1920 were often repaid with arbitrary reprisals against the civilian population. In the summer of 1920, the Black and Tans burned and sacked many small towns and villages in Ireland, beginning with Tuam in County Galway in July 1920 and also including Trim, Balbriggan, Thurles and Templemore amongst many others. In November 1920, the Tans “besieged” Tralee in revenge for the IRA abduction and killing of two local RIC men. They closed all the businesses in the town and let no food in for a week. In addition they shot dead three local people. On 14 November, the Tans abducted and murdered a Roman Catholic priest, Fr Michael Griffin, in Galway. His body was found in a bog in Barna a week later. Finally, the Black and Tans sacked Cork city, on the night of 11 December 1920, the centre of which was burned out. In January 1921, the British Labour Commission produced a report on the situation in Ireland which was highly critical of the government’s security policy. It said the government, in forming the Black and Tans, had “liberated forces which it is not at present able to dominate”. However since 29 December 1920, the British government had sanctioned “official reprisals” in Ireland — usually meaning burning property of IRA men and their suspected sympathisers. Taken together with an increased emphasis on discipline in the RIC, this helped to curb the random atrocities the Black and Tans committed since March 1920 for the remainder of the war, if only because reprisals were now directed from above rather than being the result of a spontaneous desire for revenge. (see also Chronology of the Irish War of Independence). However, many of the atrocities popularly attributed to the Black and Tans were probably committed by the far more brutal Auxiliary Division; some were committed by Irish RIC men. For instance, Tomás Mac Curtain, the mayor of Cork, was assassinated in March 1920 by local RIC men and the massacre of 13 civilians at Croke Park on Bloody Sunday was also carried out by the RIC although a small detachment of Auxiliaries were also present. Moreover, the regular British Army also committed atrocities, burning the towns of Mallow and Fermoy for example. However most Republicans did not make a distinction, and “Black and Tans” was often used as a catch-all term for all police and army groups. The actions of the Black and Tans alienated public opinion in both Ireland and Britain. Their violent tactics encouraged both sides to move towards a peaceful resolution. Edward Wood MP, a future Foreign Secretary, rejected force and urged the British government to offer the Irish an offer “conceived on the most generous lines”. Sir John Simon MP, another future Foreign Secretary, was also horrified at the tactics being used. Lionel Curtis, writing in the imperialist journal The Round Table, wrote: “If the British Commonwealth can only be preserved by such means, it would become a negation of the principle for which it has stood”. The King, senior Anglican bishops, MPs from the Liberal and Labour parties, Oswald Mosley, Jan Smuts, the Trades Union Congress and parts of the press were increasingly critical of the actions of the Black and Tans. Mahatma Gandhi said of the British peace offer: “It is not fear of losing more lives that has compelled a reluctant offer from England but it is the shame of any further imposition of agony upon a people that loves liberty above everything else”. About 7,000 Black and Tans served in Ireland in 1920-22. More than one-third of them died or left the service before they were disbanded along with the rest of the RIC in 1922, an extremely high wastage rate, and well over half received government pensions. A total of 404 members of the Royal Irish Constabulary died in the conflict and more than 600 were wounded but it is not clear how many of these were pre-war RIC men and how many were Black and Tans or Auxiliaries. Those who returned to civilian life sometimes had problems re-integrating. At least two former Black and Tans were hanged for murder in Britain and another wanted for murder committed suicide before the police could arrest him. Due to the ferocity of the Tans’ behaviour in Ireland and the atrocities committed, feelings continue to run high regarding their actions. “Black and Tan” or “Tan” remains a pejorative term for British in Ireland, and they are still despised by many in Ireland. One of the most famous Irish Republican songs is Dominic Behan’s “Come out Ye Black and Tans.” The Irish War of Independence is sometimes referred to as the “Tan War” or “Black-and-Tan War.” This term was preferred by those who fought on the Anti-Treaty side in the Irish Civil War. The “Cogadh na Saoirse” medal, which was awarded to IRA Volunteers after 1941, bears a ribbon with two vertical stripes in black and tan. If a police barracks is burned or if the barracks already occupied is not suitable, then the best house in the locality is to be commandeered, the occupants thrown into the gutter. Let them die there—the more the merrier. Should the order (”Hands Up”) not be immediately obeyed, shoot and shoot with effect. If the persons approaching (a patrol) carry their hands in their pockets, or are in any way suspicious-looking, shoot them down. You may make mistakes occasionally and innocent persons may be shot, but that cannot be helped, and you are bound to get the right parties some time. The more you shoot, the better I will like you, and I assure you no policeman will get into trouble for shooting any man.